Rates: £280 to £310 per week Family friendly? Suitable for over 5s only (supervised on the terrace). Unsuitable for people with restricted mobility. Nearest beach: Marina di Modica: 11 km Local agents? Yes. Casa Alveston is a traditional Sicilian townhouse. Originally constructed in the 19th century and recently renovated the house offers flexible accommodation arranged over three floors for couples, or groups of friends wishing to explore this beautiful corner of Sicily. Located just outside the centre of Modica but with ample off-road parking the house offers the benefits of being within easy strolling distance of the restaurants and bars in the town whilst only a short drive to the beautiful surrounding countryside and further attractions of this part of Sicily. The ground floor is given over to the entrance hall, double bedroom and en-suite bathroom (double shower, toilet, bidet, wash handbasin). The middle floor is made up of a spacious open-plan living area combining kitchen, dining room and living room. There is also a separate toilet facility on this floor. The living room contains a substantial Chateau d’Ax designer sofa that doubles up as a king-size bed – not a run-of-the-mill flop/fold out sofabed. A further set of stairs takes you up to the private terrace that enjoys an open sunny aspect with views across Modica to the famous Guerrieri bridge, the historical centre, clock tower and the surrounding countryside. The terrace is furnished with dining table and seating for 5. Whilst the house has no private parking of its own, the ample off-road parking nearby ensures that there is always somewhere to leave the car. Local amenities include local supermarkets within two minutes walk, together with bars and a range of small shops. It is possible to be outside of Modica and driving in the local countryside in 5 minutes. The following maps illustrate the location of the house within Modica and the route from the nearest airport – Comiso (which takes around 30 minutes). We bought a house here because we fell in love with this part of Sicily. 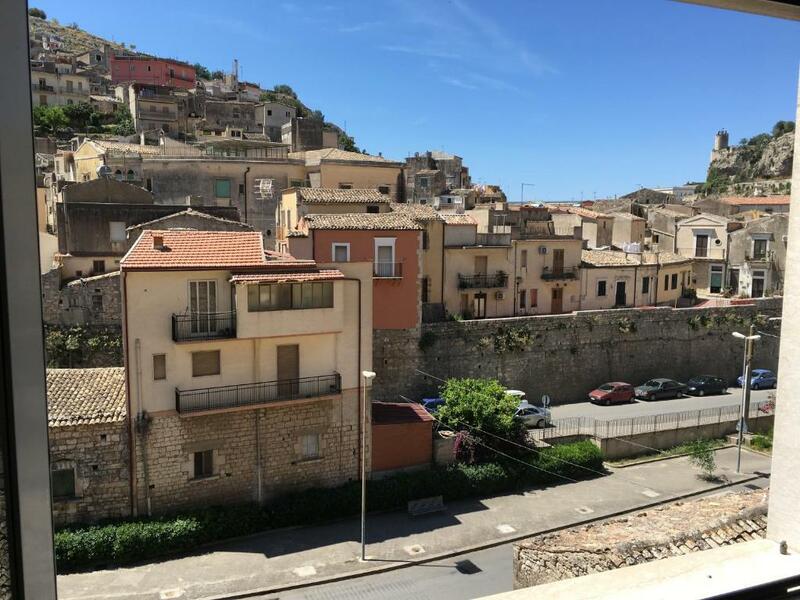 We’ve travelled extensively through Europe and eventually we bought our house in Modica in one of the two most thriving (the alternative being Ragusa) towns in this furthest corner of Sicily. If you share our enthusiasm for landscape, culture and cuisine then we’re confident you’ll feel the same about Modica and the southern provinces of Ragusa and Siracusa. Enquiries can be sent to enquiries@rentmyholidayhome.eu, via the Rental application form. The house can be booked between March and October inclusive. Lettings outside of these dates can be arranged on an ad-hoc basis. Bookings are handled via HolidayLettings.co.uk who advertise through Tripadvisor. Our local property agents, Modicasa, speak Italian, French, German and English. Al Dente in Worcester - a great place to sit & enjoy or take out simply great Italian/Sicilian food.